Otto III, Holy Roman Emperor, son of the emperor Otto II and Theophano, daughter of the eastern emperor Romanus II, was born in July 980, chosen as his father's successor at Verona in June 983 and crowned German king at Aix-la-Chapelle on the 25th of the following December. Otto II had died a few days before this ceremony, but the news did not reach Germany until after the coronation. Early in 984 the king was seized by Henry II the Quarrelsome, the deposed duke of Bavaria, who claimed the regency as a member of the reigning house, and probably entertained the idea of obtaining the kingly dignity himself. A strong opposition was quickly aroused, and when Theophano and Adelaide, widow of the emperor Otto the Great, appeared in Germany, Henry was compelled to hand over the young king to his mother. 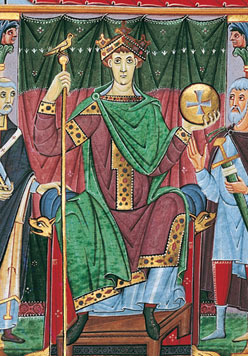 Otto's mental gifts were considerable, and were so carefully cultivated by Bernward, afterwards bishop of Hildesheim, and by Gerbert of Aurillac, archbishop of Reims, that he was called "the wonder of the world." The government of Germany during his minority was in the hands of Theophano, and after her death in June 991 passed to a council in which the chief influence was exercised by Adelaide and Willigis, archbishop of Mainz. Having accompanied his troops in expeditions against the Bohemians and the Wends, Otto was declared of age in 995. In 996 he crossed the Alps and was recognized as king of the Lombards at Pavia. Before he reached Rome, Pope John XV, who had invited him to Italy, had died, whereupon he raised his own cousin Bruno, son of Otto duke of Carinthia, to the papal chair as Pope Gregory V, and by this pontiff Otto was crowned emperor on the 21st of May 996. On his return to Germany, the emperor learned that Gregory had been driven from Rome, which was again in the power of John Crescentius, patrician of the Romans, and that a new pope, John XVI, had been elected. Leaving his aunt, Matilda, abbess of Quedlinburg, as regent of Germany, Otto, in February 998, led Gregory back to Rome, took the castle of St. Angelo by storm and put Crescentius to death. A visit to southern Italy, where many of the princes did homage to the emperor, was cut short by the death of the pope, to whose chair Otto then appointed his former tutor Gerbert, who took the name of Sylvester II. In the palace which be built on the Aventine, Otto sought to surround himself with the splendor and ceremonial of the older emperors of Rome, and dreamed of making Rome once more the center of a universal empire. Many names and customs were introduced into his court from that of Constantinople; he proposed to restore the Roman senate and consulate, revived the office of patrician, called himself "consul of the Roman senate and people" and issued a seal with the inscription, "restoration of the Roman empire." Passing from pride to humility he added "servant of the apostle", and "servant of Jesus Christ" to the imperial title, spent a fortnight in prayer in the grotto of St. Clement and did penance in various Italian monasteries. Leaving Italy in the summer preceding the year 1000, when it was popularly believed that the end of the world was to come, Otto made a pilgrimage to the tomb of his old friend Adalbert, bishop of Prague, at Gnesen, and raised the city to the dignity of an archbishopric. He then went to Aix, and opened the tomb of Charlemagne, where, according to a legendary tale, he found the body of the great emperor sitting upright upon a throne, wearing the crown and holding the sceptre. Returning to Rome, trouble soon arose between Otto and the citizens, and for three days the emperor was besieged in his palace. After a temporary peace, he fled to the monastery of Classe near Ravenna. Troops were collected, but while conducting a campaign against the Romans, Otto died at Paterno near Viterbo on the 23rd of January 1002, and was buried in the cathedral at Aix-la-Chapelle. Tradition says that he was ensnared and poisoned by Stephania, the widow of Crescentius. The mystic erratic temperament of Otto, alternating between the most magnificent schemes of empire and the lowest depths of self-debasement, was not conducive to the welfare of his dominions, and during his reign the conditions of Germany deteriorated. He was liberal to the papacy, and was greatly influenced by the eminent clerics with whom he eagerly associated.